In celebration of Black History Month, Melissa Sweet and I will be adding art images, quotes, and anecdotes from and about the life and art of West Chester artist Horace Pippin, the subject of our picture book A Splash of Red. “The End of War, Starting Home,” oil on canvas, by H. Pippin. Today, I begin with his first oil painting, The End of War, Starting Home, which took him three years to complete. The painting is part of the permanent exhibit at the Philadelphia Museum of Art, one of several art museums whose curators and staff gave us immense support and unfettered access to Pippin’s original art as we did our copious research. If you’ve been following our posts here and on the book’s site, you know that Pippin volunteered to fight in WWI and was a member of the legendary 369th NY regiment known as the “Hellfighters,” because they saw some of the longest and worst fighting in the Great War. Shot in the right shoulder by a German sniper one day as he tried to climb out of a mud-soaked trench, he nearly bled to death before help arrived and he was taken to an Army hospital. There, a French surgeon inserted a steel plate in his shoulder and when he finally recovered (the men brought in on stretchers on either side of him did not), he was sent home to the U.S. with an almost useless right arm. Through his brother in New Jersey, Horace met Jennie Ora Fetherstone Wade, a petite, twice-widowed woman with a young son. 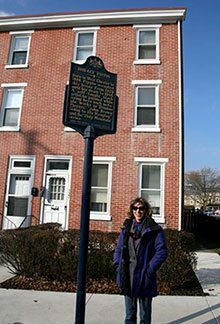 Horace proposed, Jennie accepted, and the little family moved back to West Chester, PA, where Horace had been born and where Jennie also had relatives. Horace received a small pension from the Army, and Jennie ran a laundry business, so they made enough to live comfortably, but by no means extravagantly, in their home on West Gay Street. Because of his injury, Horace could not find work, but he umpired baseball games, became active in the VFW, and helped Jennie deliver laundry. Still, in the quiet moments, and especially at night, memories of what he heard, saw, and experienced in the trenches of war came rushing back. What could he DO with those memories? His childhood love of drawing seemed a thing of the past now that he could barely lift his right arm. One night, he used his good left hand to lift his stiff right arm and picked up the hot poker from beside the fire. 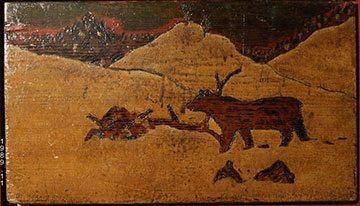 An extra wooden leaf from the kitchen table became his canvas, and he began etching a scene (Bear Hunt I, pictured here) into the table leaf. Some weight inside him was suddenly lifted. He finished the scene and began another one, using pieces of scrap wood he found in the alleys. “It brought me back to my old self,” he later said about the art he made in his post-war days. 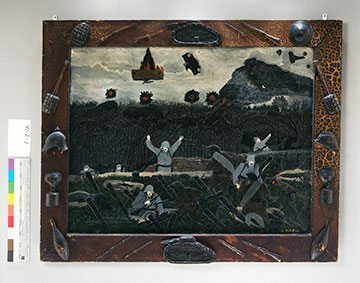 Click here to watch a short video in which you can view details of this first Pippin oil painting: The End of War, Starting Home.